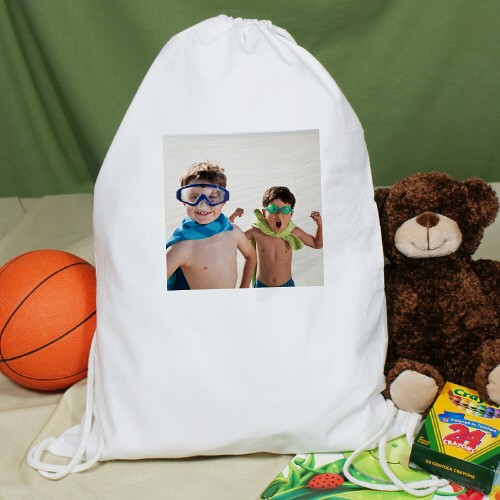 Tote around toys, games, or sports equipment for your little boy or girl in our personalized photo gifts tote. This accessory will be truly one-of-a-kind because it will feature your favorite photo on it. This will be a great keepsake to use for years to come. This picture gifts sport bag is a cotton/poly blend canvas reusable sports bag measuring 17.5" h x 13" w. Each Custom Sports Bag is made especially strong to hold your important essentials with a drawstring top closure. Free photo upload is included. Just simply upload any digital photo below. For production purposes, please enter a description that best describes the photo you're uploading. Additional Details Your little boy or girl will be able to carry around all of their favorite fun things in this personalized gift for kids! They'll carry this white photo bag for years to come, and they'll love the nostalgic photo on it. Our Picture Perfect Photo Youth Apron is perfect for the artistically inclined.